People flying in and out of South Florida airports are more likely to be delayed and for a longer amount of time than at other large airports in the country, according to the most recent report from the Bureau of Transportation Statistics from August 2016. Miami’s on-time departure percentage ranked 29th of 29 of the country’s largest airports between October 2015 and August 2016. Fort Lauderdale’s airport ranked 23rd. Frequent flyer Joe Zubi, a Coral Gables advertising executive, lives those statistics. "It’s frustrating," says Coral Gables advertising executive Joe Zubi. " It’s tough to manage your schedule around it." Zubi has logged millions of miles on American and is a fan of the dominant carrier in South Florida, but now he does see a change. 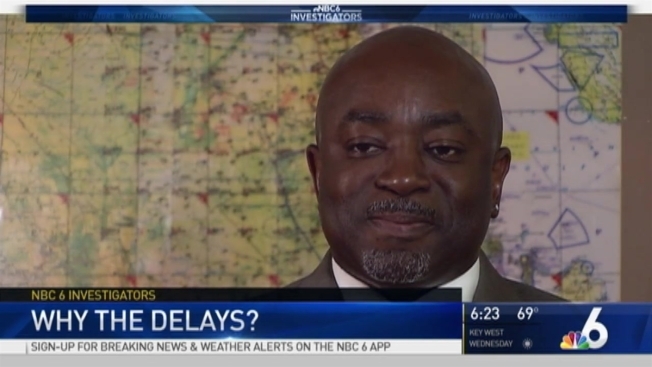 "There's a lot more delays," he stated. "A lot of flights being canceled or we are on the tarmac for much longer." The average delay in August 2016 was at the airports all-time high since 2000 at nearly 78 minutes. The national average for delayed flights was just under 70 minutes. A flight is considered delayed when it arrived or departed 15 or more minutes off its schedule. One reason for the delays is a staffing problem in the air traffic control tower. "We don’t have the staffing that we need,” said Billy Kisseadoo, President of the National Air Traffic Controllers Association at MIA. According to the FAA, Miami’s tower has 67 percent of its certified air traffic controller positions filled. That’s a more severe shortage than in other parts of the country including the Chicago O’Hare Tower at 76.5 percent and San Jose Tower at 76.9 percent. Kisseadoo says a shortage of air traffic controllers can lead to delays so safety isn’t compromised. The FAA said it shares the NATCA’s frustration. In a statement, the FAA said the past government shut down and budget cuts closed the FAA controller training academy for nine months, delaying initial training for several classes of new air traffic controllers. The agency says it’s working hard to hire at an increased rate to meet staffing targets. More than 29,000 people applied for 1,400 open positions posted in August. Getting an air traffic controller fully certified can take up to three years. Another factor that leads to delays what's known in the airline business as "banking" where airlines tightly schedule fights so they take off and land about the same time. "If you cluster them, there’s going to be inherent delays built into the scheduling," said Paul Hudson of flyersrights.org. American Airlines which operates nearly 7 of 10 of the flights at MIA showed its flight operation center where employees overlook the ramp in an effort to keep jets moving past a bottleneck that takes place along the northwest corner of MIA’s taxiway. American told us the banking is done to make it easier for their passengers to get to their destinations quickly. American told us it’s working with the FAA to develop a schedule that it hopes will reduce delays. A spokesperson with MIA echoed that the airport is also working with the airline and FAA on schedules. Hudson believes the FAA may need to do more. "I am afraid that the administrator of the FAA may have to, in certain cases, do some emergency orders to spread out flights or cancel flights that are chronically late," he said. He advises travelers to avoid peak hours and always check a fight’s on-time schedule. He recommends confirming a flight takes off on-time at least 80 percent of the time. Another factor is the growth at MIA where passenger loads are up 2 percent this year. The airport also sees more international traffic than nearly any other airport.